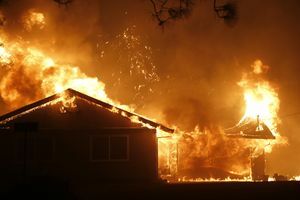 Insurance claims from the recent spate of California wildfires, including one ranked as the most deadly and destructive in state history, have topped $9 billion and are expected to grow, the state... insurance commissioner reported on Wednesday. 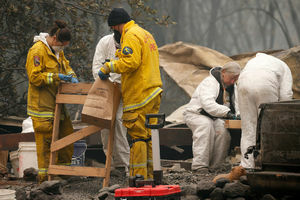 Three weeks after flames incinerated most of a Northern California town in the deadliest U.S. wildfire in a century, the search for more human remains has officially ended with at least 88 people... confirmed dead and nearly 200 still listed as missing. 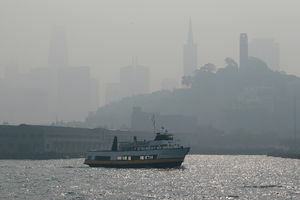 More rain is forecast for northern California over the weekend, boosting firefighters' efforts to extinguish the last of the wildfires that have raged there for two weeks, but raises the risk of flash... floods and landslides in the scorched Sierra Nevada foothills. Local officials say more than 1,200 people reported missing - but that number could fluctuate. 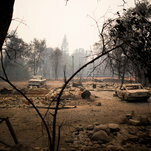 The number of people missing after California's deadliest and most destructive wildfire jumped on Saturday to 1,276, despite authorities locating hundreds of people who scattered when the Camp Fire... tore through the mountain town of Paradise. 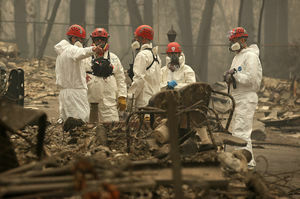 Another eight bodies have also been found, bringing the death toll in the Camp Fire to 71. 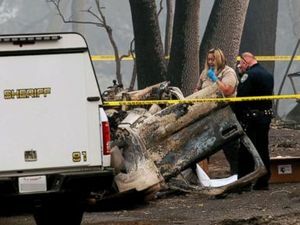 The number of dead victims in the Northern California wildfire has increased to 71, while the missing persons list has grown from 631 to over 1,000. 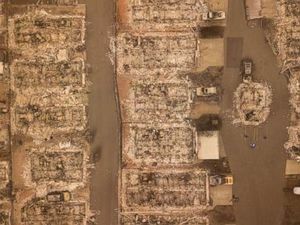 On Thursday, search teams in Northern California discovered seven more bodies in the Camp Fire burn area, bringing the blaze's death toll to 63. Authorities say there are now 631 people missing, up... from 130 on Wednesday evening. 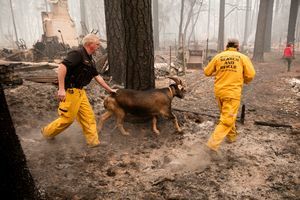 The fire, the deadliest in state history, has burned 141,000 acres, destroyed 11,862 structures, and is about 40 percent contained. 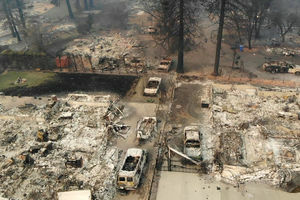 Most of the deaths occurred in the town of Paradise, which was almost entirely wiped out by the fire. 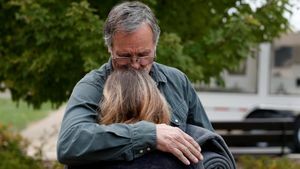 Officials said it could take several weeks to finish searching for victims. 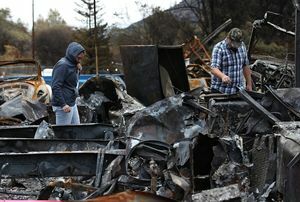 Hundreds of rescue personnel dressed in white overalls are sifting through smoldering rubble and mangled cars, searching for human remains in California's deadliest and most destructive wildfire. 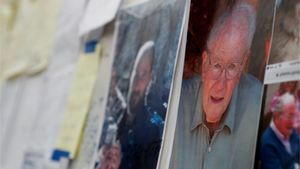 U.S. National Guard troops fanned out to scour the ruins of the devastated town of Paradise on Thursday for remains of victims as 130 people remained listed as missing in California's deadliest... wildfire on record, whose death toll has risen to 56. 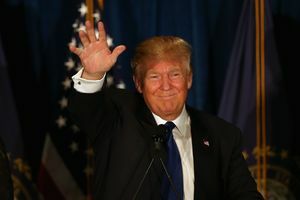 The company's stock has been cut almost in half since last week as investors assess the potential payout if its equipment is found to blame. Butte County Sheriff Kory Honea announced the grim news during a press conference, acknowledgingthe "very, very difficult task" of trying to find bodies in charred homes could mean that residents will... eventually be the ones to discover loved ones themselves. 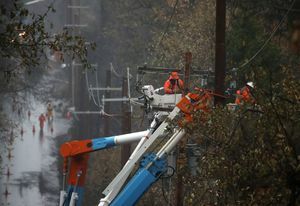 Sixteen crews of prison inmates are assisting to help contain the Camp Fire that has destroyed thousands of acres about 90 miles north of Sacramento.